Rocket League is about to dip its toes into the Mesozoic. Or, at least the scientific recreation of the Mesozoic. Specifically, the Jurassic Era. Okay, you know where this is going. Jurassic Park. It's Jurassic Park. 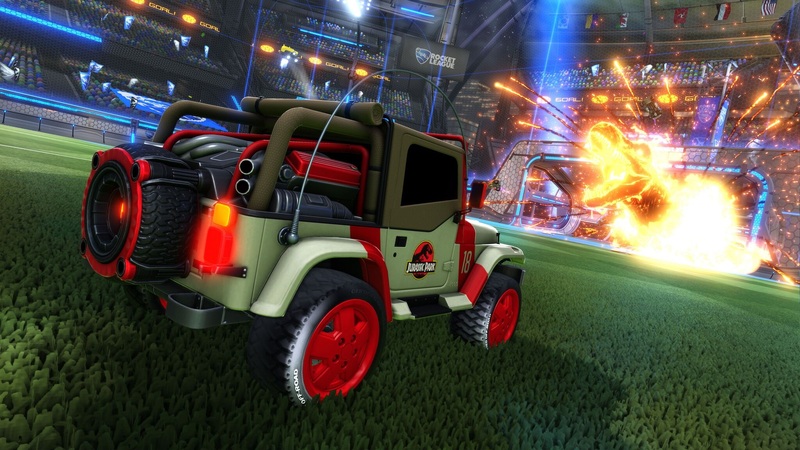 Later this month, just ahead of the release of Jurassic World, Psyonix is adding the Jurassic Park Jeep to Rocket League. The $2 download will include the Jeep, a T-Rex goal explosion, a hard hat topper, three themed banners, and three themed flags. It goes live on June 18 on all platforms. Psyonix has confirmed that the Jeep has the same hitbox as the Octane, which is Rocket League's most popular car among experienced players. Also, the goal explosion is reminiscent of the Black Market Hellfire explosion, but with a dinosaur rather than a demon's head. Considering it can be equipped to any car (not just the Jeep), this pack's a good deal based on that alone -- at least for anyone who's looking for a cool goal explosion. It's certainly a lot cheaper than burning through crates and keys hoping the RNG smiles favorably upon you.